With Mother’s Day coming up, what better excuse to share some of my favourite Scottish designers and makers? If you follow the Just A Card campaign, you’ll be aware that all independent small businesses appreciate all the support you can give, so this is a great time to show some love for some Scottish creative businesses! They’re all independent, and unique, and I personally think they’re all amazing! Inspired by nature, Hannah’s drawings capture the joys of each season, and the wonderful creatures she sees on her walks in the Scottish Borders. She has such a delicate touch, and I love all her work- I have some of her drawings and a calendar on my wall, and a stash of her cards ready whenever I need them! There’s definitely something for Mothers Day on her website. Mimi is based in Aberdeen, and creates fun, colourful prints that I just love. 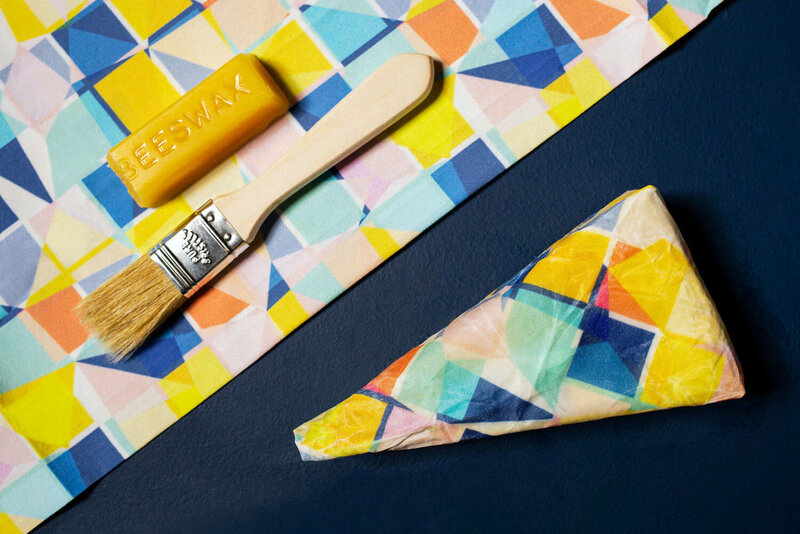 Most recently she has launched Mimibeewax Wrap making kit- so you can make your own bees wax wraps as a great alternative to cling film. I think this is one of the best gift ideas I’ve seen in ages- not only can you make it yourself, have Mimi’s designs in use in your kitchen, it’s also one step towards plastic free living! Helen is also based in Aberdeen, and also a print designer, creating really beautiful, intricate designs. On the theme of reducing waste, Helen has the offcuts from her scarves made into beautiful notebooks, which would make a wonderful gift. Based in Fife, Caroline designs and makes enamel jewellery inspired by the Scottish coastline. I love her colours and shapes, and now have several pairs of earrings, and necklaces that go perfectly with my knitwear. My mum also has earrings by Caroline, which she wears every day; so I can safely say they make a great treat for mothers! Jude designs and makes beautiful, hand stitched leather and wool felt purses near Dundee. She also runs workshops for you to make your own, which would also make a great mothers day gift. I love using her bags- the shape is so satisfying, and they’re so beautifully made. Handcrafted in Glasgow, by Annette, these are fabulous artisan chocolates! Annette champions the use of local ingredients to infuse her ganaches, and creates great flavour combinations. I highly recommend the gin selection boxes- delicious! Our beautiful skinny silk scarves are perfect for heading into Spring, and would make a lovely Mother’s Day gift. They’re a little bit of luxury, made in the studio and hand finished for the personal touch!